It happens with every new presidential administration in modern times, the promise to “do more about the nation’s infrastructure problems.” But, what happens after these words are spoken? Who becomes the voice of the people and makes sure that these promises are kept? The United States Conference of Mayors plays a major role in not just ensuring that administrations “make good” on the promises, but in helping to shape infrastructure plans and make the most efficient, effective use of federal funding. So who exactly are the U.S. Conference of Mayors? They define themselves as, “the official nonpartisan organization of cities with populations of 30,000 or more.” Currently there are 1,393 of these cities in the U.S., and each one is represented in “The Conference” by its mayor. The U.S. Conference of Mayors recognizes that the country’s economic health, physical health and leaders depend on addressing infrastructure issues immediately and strategically. This is why at The Conference’s 85th annual meeting this June infrastructure will occupy notable space on the four-day agenda. In preparation for this meeting, the CEO and Executive Director of the U.S. Conference of Mayors, prepared an eye-opening report that offers 40+ pages of case studies that, together, demonstrate how city governments are the fuel for achieving infrastructure goals better and faster than through state and/or federal programs. The report—titled “On Task, On Time, On Budget: How Mayors Build, Maintain and Renew America’s Infrastructure”—looks at projects ranging from water, wastewater and flood control, to transportation and energy. And in my opinion this report makes a great argument for expanding partnerships between private utilities and public municipalities to not only update infrastructure itself, but also spur economic growth and job creation as well. There are over 50,000 community drinking water systems in the U.S., all facing numerous challenges, from access to capital, to basic operational efficiencies. The needs of every community are unique, which is why when American Water works with municipal partners to create solutions, it dedicated to local involvement, improving the quality and reliability of customer service and community water or wastewater systems, updating pipes and treatment plants to handle new growth, and being a good neighbor in the areas we serve. The connections and resources to get the public and private sectors working together on infrastructure improvements. The ability to create jobs and fill those jobs with a qualified, dependable work force. Foresight to implement infrastructure improvements resulting in tremendous savings—in terms of money, energy and less stress on the environment. Insights leading to better service and quality of life by meeting the specific needs of a given community. Lastly, it’s important to look at the last two words of this report’s title, America’s Infrastructure. What makes the U.S. Conference of Mayors’ infrastructure mission so exciting is the fact cities are working together to provided building blocks for a better America. Together, they operate with the knowledge that one city’s infrastructure achievement is a valued piece completing the puzzle. And, therefore, all the mayors work together to influence policy and changes that can benefit everyone… and that keep the promise on track to driving nationwide infrastructure progress. And the Oscar Goes to… Everyone’s Favorite, H2O! For emergencies, we’re available 24/7. 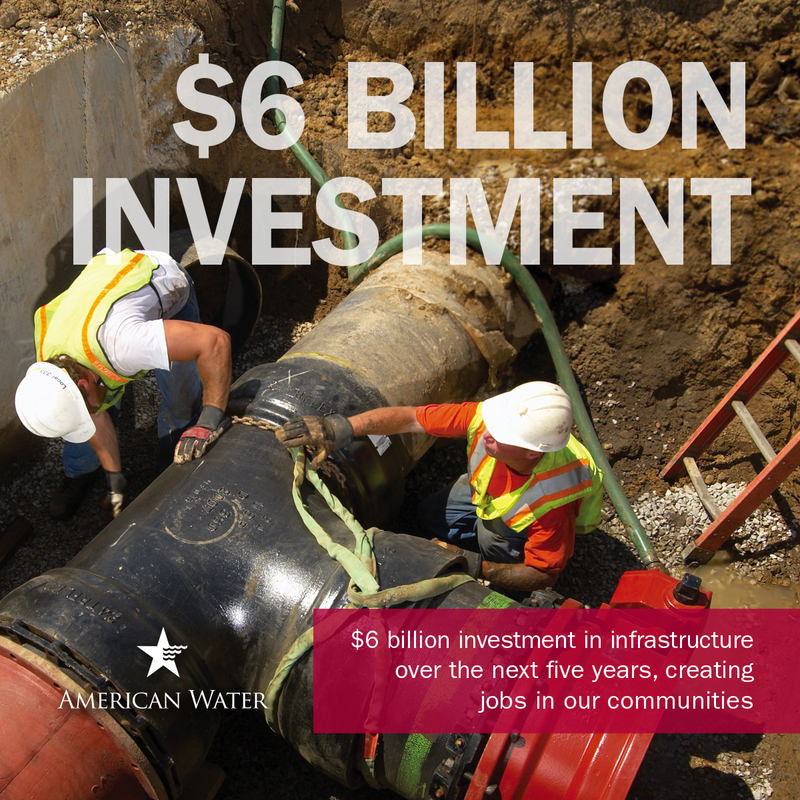 © 2019 American Water. “American Water” and the star logo are the registered trademark of American Water Works Company, Inc. All rights reserved.